This article is about the original series. For the 2015 revival, see Horrible Histories (2015 TV series). Horrible Histories is a British sketch comedy and musical television series, part of the children's history books of the same name. The show was produced for CBBC by Lion Television with Citrus Television and ran from 2009 to 2013 for five series[note 1] of thirteen half-hour episodes, with additional one-off seasonal and Olympic specials. The TV show carries over the graphic style and much of the content of the Horrible Histories book series. It maintains the franchise's overall irreverent but accurate focus on the dark, gruesome or scatological aspects of British and other Western world history, spanning from the Stone Age to the post-World War II era. Individual historical eras or civilisations are defined and named as in the books, with sketches from several different time periods combined within a single episode. Live-action sketches—which often parody other UK media or celebrities—and music videos are intercut with animations and quizzes. The starring troupe are Mathew Baynton, Simon Farnaby, Martha Howe-Douglas, Jim Howick, Laurence Rickard, Sarah Hadland and Ben Willbond, alongside a large supporting cast headed by Katy Wix, Lawry Lewin, Alice Lowe and Dominique Moore. The black rat puppet "host", Rattus Rattus, appears in short bridging segments, explaining the factual basis for each sketch. The creative team was largely recruited from the mainstream adult UK comedy scene. They took inspiration from such quintessentially British historical-comedy classics as Blackadder and the Monty Python films. The series was a critical and ratings success, eventually gaining a wide all ages audience through its non-condescending and inclusive approach. It has won numerous domestic and international awards and has been named among the greatest British children's television series of all time. In 2011, a spin-off game show, Horrible Histories: Gory Games, was launched on CBBC. In the same year, the original show was repackaged for main channel BBC One as Horrible Histories with Stephen Fry, with Fry replacing the puppet rat as presenter. A new series of special episodes began airing in 2015, featuring a new format and cast. Although the original series has ended, it continues to be frequently repeated on the CBBC Channel daily. 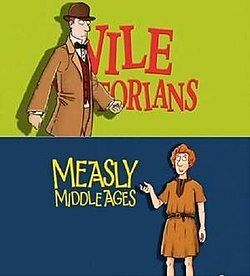 Horrible Histories is based on the British children's historical-comedy book series by Terry Deary, first published by Scholastic UK in 1993 and since expanded into a multimedia franchise. The books and subsequent spin-off materials are intended to pique young children's interest in history via short, factually based but humorously told anecdotes highlighting aspects of the subject not usually covered in more traditional educational sources. LionTV executive producer Richard Bradley, whose company had previously produced several adult history-themed programmes and whose son was a fan of the Horrible Histories books, was the initial driving force behind a new TV adaptation. Deary was initially sceptical, having had a negative experience with the 2001 animated series, which had only loosely incorporated his concept. He finally agreed to the new project on the condition that it be explicitly "horrible, funny and true". While disclaiming any active role in developing the subsequent series, he would eventually contribute to the writing as well as appearing in several small roles. The producers were determined that the show be respectful of audience expectations for the Horrible Histories brand, maintaining its familiar visual style and content as far as possible. Early concepts for bringing it to the screen involved framing or interpretive devices, including a ghostly train carrying children into the past, or a wizard storyteller to act as their guide. Eventually Bradley with producer/director Dominic Brigstocke concluded that the material was strong enough to stand on its own, so they developed, in consultation with CBBC executives, a live-action sketch-comedy showcase. Once the writing was underway, the producers further discovered that sticking as closely as possible to the historical truth made it easier for them to find the humour within it. They then introduced a comedy style relying on parodies of familiar modern media conventions as a means of making these historical details more immediately accessible. To do the material full justice, Brigstocke and series producer Caroline Norris used their industry contacts to put together a creative team consisting mostly of veterans of the adult UK comedy community. The BBC readily agreed to this cross-demographic experiment. They also approved the adoption—insofar as was possible in a programme aimed at young children—of the core franchise precept of "history with the nasty bits left in", which frequently involved "gross-out"-style bodily function humour and comic violence. The new creative team, while avoiding references aimed specifically at adults, was determined not to adapt the humour to children or otherwise patronise their audience. Instead, they sought to make the best use possible of the material. Norris said that her goal was "to make a show that people would say was too good for children ... we started out with really high ambitions." To that end, adult historical satires such as Blackadder and the Monty Python films were shown at the first writers' meeting to demonstrate the proposed tone, and these influences would be visible throughout the show's run. Once the first series had aired and it was realised that the overall approach was working well, the creative team built on and significantly expanded the scope of the comedy elements for the second. This trend continued through each subsequent series. The net result was a show that immediately appealed to young children while also gaining the increasing respect—and viewership—of older audiences. The divisions by historical era or civilisation in the book series are carried over in the TV show, focusing on events in or directly affecting Great Britain and (to a lesser extent) the larger Western world. The Inca and Aztec empires are also featured in later series. Sketches are grouped under these divisions, named as in the books, beginning with the Savage Stone Age and including among others the Cut-throat Celts, Awful Egyptians, Groovy Greeks, Rotten Romans, Vicious Vikings, Measly Middle Ages, Terrible Tudors, Slimy Stuarts, Gorgeous Georgians and Vile Victorians. The timeline for the most part ended at the Woeful Second World War. During the fifth and final series the show featured a handful of significant post-World War II (or "Troublesome Twentieth Century") events, including the civil rights movement and the Space Race between the US and the USSR. The most recent event referenced was the 1969 Apollo 11 Moon landing. Each named division has its own title card that appears before each sketch (or group of sketches) set in that era or civilisation, along with a short introductory animation featuring a period-appropriate character. Throughout each sketch, small pop-up signs are used to affirm the truth (or otherwise) of any particularly implausible-seeming concepts mentioned onscreen. The live-action material is intercut with short animated sketches, quizzes and interludes with puppet "host" Rattus Rattus (performed by John Eccleston), who addresses the viewer directly as a presenter, commenting on and clarifying the factual basis behind the humour. Rattus also occasionally holds up pop-up signs himself during sketches. Sketches were filmed en masse and then cut into episodes by the producers based on creative rather than chronological or other educational considerations, in the manner of a more traditional sketch-comedy series. They often fall under a recurring banner—usually with its own short title sequence—but otherwise vary widely in length, visual style and approach. Many are recognisable parodies of other popular media or celebrities, in formats ranging from spoof commercials to mock TV shows, newscasts, magazines, video games and film trailers. Notable parody inspirations included Masterchef, Wife Swap, Come Dine with Me and The Apprentice. "Horrible Histories Movie Pitch", in which historical figures pitch their life stories to a panel of Hollywood producers played by League of Gentlemen actors Mark Gatiss, Steve Pemberton and Reece Shearsmith, used the format of a former commercial campaign for Orange's cinema reminders to turn mobiles off. The show also created several popular recurring characters and concepts, notably "Stupid Deaths", in which a skeletal, platinum-blond Grim Reaper amuses himself while processing souls for admittance to the afterlife by forcing candidates from throughout history to relate the embarrassing details of their demise. HHTV News' Bob Hale and his eccentric-but-erudite in-studio reports provide a broader picture on historical events (such as the Wars of the Roses and the French Revolution), in a style reminiscent of presenter Peter Snow. The "Shouty Man", a parody of a typically ebullient infomercial host (like Barry Scott), pitches unusual historical products. Original music plays a significant role in the show and its popularity; "Music from Horrible Histories" was chosen as the 2011 theme of the BBC Proms' annual children's concert. Alongside various short intro themes and commercial jingles, each episode[note 2] and each special contains at least one longer comedy song centred around a particular historical figure or theme and performed by the cast in appropriate character. In the first series, the songs generally had no particular satirical slant, and were often intercut with sketches from the same era. However, after the creative team noted the critical and popular success of the major exception ("Born 2 Rule", which featured King Georges I–IV performing in the style of a boyband) the decision was taken from the second series onwards to continue in that vein. Historical concepts were matched to a diverse range of modern musical references, and the results were showcased as self-contained music video parodies. The thirteenth episode of the second and each subsequent series was retooled as a "Savage Songs" special, featuring a compilation of that series' outstanding videos. The songs have since become among the most critically and popularly acclaimed elements of the show, especially among its adult audience. Commentators cite the apt cleverness of the various historical/musical parody match-ups, and the complexity and skill with which the musical elements are executed. Principal composer Richie Webb confirms that the songs became more sophisticated as a result of the show's increasing popularity with older viewers, as well as the demands of increased visibility online. Many of the videos have earned standalone popularity on YouTube. No formal educational method was applied to the production, and no attempt was made to follow the official UK National Curriculum for primary school history. The show's creators were acutely aware of educational possibilities, but—in line with Deary's overall mandate for the franchise—saw their basic role as popularising history, inspiring further curiosity about the academic subject rather than attempting to teach it seriously. The show's effectiveness in this respect was endorsed by historical scholars, including presenter Dan Snow. Writing in The Independent, Gerard Gilbert notes that Horrible Histories is part of an extensive British black-comedy tradition not only in adult but also in children's programming. In later series, as usable material from the books began to run out, there was a progression towards more sophisticated, adult sketches in terms of both creativity and educational content, as the show began relying on material that their younger viewers would be less familiar with. "My aim for this was always that kids would go away and read up more about a subject. They love all the slapstick, but they also love what Terry does really well in the books—telling you something your parents don’t know. When you’re eight years old you get told what to do by everyone, so being able to teach your dad something is amazing." Throughout, emphasis was placed on meshing comedy with the demands of historical accuracy, as defined by the mainstream scholarly consensus on the topic. This stance sometimes encompassed traditionally accepted if not actually well-documented anecdotes, such as those involving Caligula. All the material used on the show was vetted by production assistant and self-described "tyrannical pedant" Greg Jenner during both writing and filming; he says that he has counted only eight errors out of more than 4,000 facts presented over the course of the show's run. Costuming and makeup were likewise painstakingly recreated based on primary historical sources where available. When an error was discovered, the effort was made to correct it whenever possible. This process is perhaps most noticeable in the evolution of a song featuring the four Hanoverian King Georges: lyrics in the original 2009 video incorrectly saying that George I had "died on the loo" were correctly reassigned to George II for the song's reprise at the show's 2011 BBC Prom concert. Taking cues from what Deary describes as his "seriously subversive" attitude towards the mainstream British history education model meant that the show inevitably incorporated sociopolitical comment. Perhaps most explicitly, Scots-Jamaican nurse Mary Seacole was deliberately championed in both a sketch and later song as a forgotten heroine in the shadow of Florence Nightingale. The activities of African-American activists Harriet Tubman and Rosa Parks were also showcased, as was ex-slave boxer Bill Richmond. According to Norris, a desire to include more women's stories was hampered by the traditionally male-dominated viewpoint of historical records. The show did make an attempt to counteract this by giving showcase songs to the British women's suffrage movement and women's work on the British homefront during World War II, and wherever possible highlighting strong-willed, dynamic female figures, including Queen Victoria, Elizabeth I and Boudicca. Religious controversies, class divisions, the ethics of conquest, and labour conditions were likewise touched on. The association with a proven and popular children's brand focusing on potentially sensitive subjects enabled the TV series to deflect any serious controversy regarding the same subjects, as they had demonstrably already been presented to children without any ill effects. Senior writer Steve Punt said that there were in fact very few complaints regarding the initial series' content, adding that "everyone was very relieved". The producers did consider some topics intrinsically unsuited for an irreverent comic treatment, as for instance the Holocaust or the harsher details of slavery, and avoided them accordingly. Norris has described her personal criteria for age suitability as whether she would be nervous watching it with a ten-year-old. While BBC executives in large part were willing to concede the requirements of reflecting historical realities, some topics, notably suicide, needed careful handling to avoid potentially negative impact on younger viewers. The show sometimes acknowledged particularly emotive subject matter (the World War I Christmas truce, for example) by following up the sketch not with a joke, but a more sombre elaboration of the less comedic details. The TV series used the Horrible Histories brand, logo and associated trademarks under licence from publisher Scholastic Books. It was produced for the BBC by LionTV and Citrus Television,[note 5] with post-production being handled by Platform Post Production. Under series producer Norris and directors Brigstocke, Steve Connelly and Chloe Thomas, each series of thirteen episodes took approximately one year to produce. The process included several months of research into the historical facts, two to three months of writing, eight weeks of filming both on location and at London's Twickenham Studios, and three to four months of post-production. At first the sketches were derived almost exclusively from the books, whose multimedia approach, consisting of short anecdotes interspersed with cartoons, diaries, newspaper articles and recipes, proved easily adaptable to the screen either as raw material or creative inspiration. In later series, as usable material from the books and other obvious sources began to run out, concepts were drawn from more standard historical texts under Jenner's supervision. He and fellow researchers read through many different studies and picked out suitably quirky, intriguing snippets, which were then pitched to the writers for development. Inspiration for the music videos came from many different sources, and input from all members of the show's creative team was encouraged. With the exception of "A Gorgeous Georgian Lady", adapted by Deary from his book Gorgeous Georgians, all songs were original to the series. Once Jenner and Norris had finalised the subject matter and music genre, lyrics were commissioned from the writing team, usually Dave Cohen. These were rewritten as needed under Norris' supervision to ensure as much factual information as possible was included. Webb then composed and recorded each song's instrumental track at Noisegate Studios, hewing as closely as possible to the style of the genre or artist in question. The finished vocal and backing tracks were later returned to Noisegate for post-production by Webb and colleague Matt Katz. The 2D animated sequences were directed by Tim Searle of Baby Cow Animation, based on Martin Brown's illustrations for the books. They were voiced by Jon Culshaw and Jess Robinson along with various regular cast members. Video game-styled sketches were achieved using a mix of 3D animation and live-action green-screen footage. Properties frequently were modified foodstuffs, with melted chocolate bars standing in for excrement and soup for vomit. Each series debuted in the UK in April or May from 2009 to 2013, and on international channels including Canada's BBC Kids, Malaysia's NTV7, The Philippines GMA Network, and Australia's ABC3. Six special episodes, comprising a mix of new and existing material around a single theme, were broadcast in the UK. "Horrible Christmas" (aired in 2010) was followed by a "Sport Special" (July 2012, to coincide with the 2012 London Olympic Games) and a "Scary Special" (autumn 2012, themed around Halloween). "Ridiculous Romance" (themed around Valentine's Day) aired in February 2014; the "Frightful First World War Special" aired later the same year, as part of the BBC's commemoration of the 100th anniversary of the outbreak of World War I. In autumn 2011, the BBC edited footage from the show's summer Prom concert into an hour-long TV special ("Horrible Histories' Big Prom Party"), featuring specially shot linking sketches. In addition, standalone sketches hosted by Stephen Fry, as well as a special "Bob Hale Report", were produced as part of the 2012 Sport Relief benefit programme. In the same year, several sketches were commissioned as part of the BBC's live television coverage of the Diamond Jubilee of Elizabeth II, to be performed on Tower Bridge, but due to time constraints only one was aired. The producers decided to cease full-time production after the fifth series, citing concerns around the increasing difficulty in finding suitable historical material. However, the possibility of further specials marking important historical or holiday milestones has been discussed. In 2015, the BBC announced that the Horrible Histories concept would be revived in a new format, focussing on the life and times of a single historical figure per episode. The rebooted series was again developed by LionTV and will involve a largely all-new production team and cast, while still retaining Jenner as lead historical consultant and many of the original series's writers. In addition, original stars Farnaby and Howick will return in limited roles. The cast members were recruited from sketch and character comedy, having previously had roles in Gavin & Stacey, Peep Show, The Thick of It and The Mighty Boosh TV series among others. Several of the writers and researchers also occasionally appeared in front of the camera, including Punt, Jenner, George Sawyer and Susie Donkin, while actors Mathew Baynton and Ben Willbond sometimes contributed to the writing. Laurence Rickard was recruited solely as a writer, but found himself part of both the senior writing staff and starring cast after creating the character of Bob Hale, whose extended, convoluted monologues proved impossible to hand over to anyone else. Individual sketches and songs were cast by the production team, sometimes acting on input from the show's stable of performers themselves. While certain roles naturally lent themselves to a particular actor, Norris said that confidence in the entire cast's ability was such that the producers also experimented with casting against type. The demands of filming thirteen episodes' worth of material in the same timeframe as a standard six-episode sketch show, while coping with the many complex makeup and wardrobe changes required, resulted in casting also being partially dependent on the logistics of moving a performer from one character to another. Recurring characters were if at all possible played by the actor who had originated the part, leading to the development of several signature roles, as for example Baynton's Charles II, Jim Howick's Shouty Man, Rickard's Bob Hale, Willbond's Henry VIII, Martha Howe-Douglas' Elizabeth I and Simon Farnaby's Death. The performers were allowed to improvise provided that they maintained factual accuracy. Howick said that improvisation was actually often necessary due to the rapid-fire pace of filming, which left very little time to prepare for individual roles. On the other hand, both Rickard and Baynton suggest this enforced spontaneity may have ultimately worked to enhance the comedy, not least by preventing the jokes from becoming over-rehearsed. Six performers (Baynton, Howick, Rickard, Willbond, Howe-Douglas and Farnaby) were credited as main or starring cast throughout the show's run; a seventh, Sarah Hadland, left after the second series but returned with an "also starring" credit for the fourth and fifth. The initial sextet appeared from Series 2 onwards as the standard face of the show at premieres and other press opportunities, and performed as a troupe for such peripheral events as the show's BBC Prom concert. They became a particularly close-knit group both personally and professionally. Eventually this led them to continue working together after Horrible Histories ceased full-time production, creating, writing and starring in the TV series Yonderland and feature film comedy Bill. Victoria of Great Britain (Series 1), presenter of "Ready Steady Feast" (Series 1), emergency ward nurse in "Historical Hospital" (Series 1), Mandy the dental assistant in "Historical Dentist", Nefertari, narrator of "Dodgy War Inventions"
Series 1 to 5 Presenter of "HHTV Sport"
Series 1 Host of "This is Your Reign"
Series 1 Shelley the assistant at "Historical Hairdressers"
Puppeteer John Eccleston, operates the puppet rat host, Rattus Rattus, whilst also supplying his voice. Scott Brooker performs additional puppetry. Jon Culshaw, Jess Robinson, and Dave Lamb provide various additional voice-overs and narration throughout the series. Horrible Histories was immediately, and almost universally, greeted with critical enthusiasm. On its debut, Alice-Azania Jarvis of The Independent described the show as "fun, filthy and genuinely engaging, in a peer-to-peer way." Harry Venning in The Stage approved the "seriously funny, beautifully performed and endlessly inventive sketches" along with "plenty of crowd-pleasing fart and poo gags." By the second series, the show's cross-generational appeal was beginning to attract significant attention from adult media. Naomi West of The Daily Telegraph characterised the first series as "boundary-pushing", suggesting that "the bold decision to approach the series in the same way as an adult show has been the key to its success ... [it] delivers more laughs than most post-watershed comedies." James Delingpole in The Spectator likewise recommended the show to viewers of all ages, saying that "Even though there are vast quantities of entirely gratuitous fart, bottom and wee wee jokes, the cumulative effect—bizarrely—is one of dumbing up rather than down." Discussing the first two series in The Guardian, television writer Jesse Armstrong said that "Hit shows are very difficult to achieve. You need to have everything just right—that's what's so terrifying. But Horrible Histories has a great cast and brilliant writers. They're also blessed with great source material. The tone is perfect and it is done in a non-patronising, engaging way". Clare Heal of the Daily Express, in her review of the third series, praised the show's "spot-on spoofs of modern telly" and agreed that "There's no particular target audience but pretty much anyone of any age will find something in there for them". Kerrie Mills of PopMatters rated the first three series 9/10, opining that the show "does also provide evidence, edgewise between the falling bodily fluids, of a sharp comic intelligence ... in fact, it might just be one of the most successful original comedy shows to appear in years." Stephen Kelly of The Guardian argued that the fourth series had definitively transcended its roots to become not just "the best show on children's television—it's one of the smartest comedies on TV", performed by an "astonishing cast ... so superb that even special guest stars such as Chris Addison can look slightly out of their depth." In an article discussing the League of Gentlemen troupe's appearance in the same series, the Radio Times' Gareth McLean agreed that "despite nominally being a children's programme, Horrible Histories is one of the best sketch comedies on TV", adding that "ultimately, comedy performers relish [the] madcap, sometimes deliciously silly exuberance, which, thanks to the show's razorsharp writing, educates as well as entertains." Graeme Virtue of The Scotsman called the League's reunion a "coup" for the series: "While Gatiss's American accent was pretty duff, the bickering spark between the three Gentlemen remained." In her review of the fifth series, Deborah Ross of the Daily Mail wrote of her sheer pleasure in watching the show without her children, calling it "still unfailingly brilliant and funny and silly, without ever losing its sense of purpose ... There just isn't anything else on TV that can match it for ideas, writing and performance." Sarah Dempster of The Guardian agreed, adding that "Four years into its ingenious 'making history look less crap' operation ... HH remains true to its aim, with meticulously harvested historical data + roaringly well-observed pop culture pastiches = seemingly infinite heritage lolz." Writing in The Independent, Grace Dent commended the cast in particular, saying that the show "has the distinct feel of a group of bright, young, erudite, writery-actory sparks having a tremendously good time." Venning of The Stage reiterated his praise of the show, adding that "it also has the courage to tackle potentially controversial events head on", specifically citing the song featuring the Civil Rights Movement activist Rosa Parks as retelling her story in a "clever, concise and accessible way without trivialising it." In 2016, Margaret Lyons of The New York Times praised the series as "deeply silly", "frequently hilarious", and,"very consistent". Most criticism of the show revolves around the accuracy and presentation of its factual content. The TV series, like the books, has been used by educators as a classroom aid and was endorsed by UK Education Secretary Michael Gove as useful for spotlighting "neglected periods of history." However, writing after the final episode, Simon Hoggart in The Spectator noted that "There has been some whipped-up controversy about Horrible Histories", adding that "where the books make a rudimentary attempt to teach history as a series of interconnected events, the television show is basically gags, chiefly about defecation, gluttony, murder and torture. It's quite amusing, though whether it will pique an interest in the subject, or—as some say—merely encourage children to learn more about defecation, gluttony, murder and torture, we cannot know." More specifically, in September 2014, responding to a complaint from the Nightingale Society, the BBC Trust determined that the show had breached editorial guidelines in the sketch highlighting the controversy surrounding Mary Seacole's role in nursing history. In this sketch, Florence Nightingale says that she rejected the Jamaican-born Seacole's application to Nightingale's Crimean nursing corps because it was open to "British girls" only. This was held to be imputing racially discriminatory motives to Nightingale—and thus implying them to be historical fact—without sufficient proof. In response, the BBC pulled the offending sketch from their website and announced it would be removed from future showings of the episode. In a 20th-anniversary retrospective of the franchise in The Telegraph, David Horspool, the history editor of the Times Literary Supplement, defended the show's overall viewpoint, saying, "There's no particular reason why grown-up historians shouldn't like Horrible Histories too ... They simplify, and they have a definite point of view, but all historians are guilty of that to some degree." He further said that "Getting children interested in the past isn't necessarily easy, and Horrible Histories does it extremely effectively—and those who come to history because it's fun seem far more likely to stay with it in the long run." Writing for entertainment website DorkAdore, Anna Lowman added that "Terry Deary had the fine idea of getting kids into history by giving the facts a human face and a joke or two ... The producers of the CBBC show have perfectly transferred Deary's ethos to television." The recut for BBC1 with Fry as host drew particular criticism as to whether its educational methods were suited to an adult demographic. History Today editor Paul Lay called the idea "frightening". Historian and Labour Party MP Tristram Hunt, while admitting that he had not yet actually seen the programme, voiced his concerns that the show's content was not "challenging and stimulating" enough for the BBC, adding that "For children, Horrible Histories is an exciting aid to engage with the guts and gore of the past, but there are more sophisticated, populist ways of getting people involved in history than this. I'm in favour of populism, but there has to be a bit of depth to it." Other critics have taken a more lenient view. Historian and television presenter Dan Snow described the show's modus operandi as "one step above Blackadder, but that's fine ... it plays to stereotypes, but it's fantastic as entry-level history." Writing in The Independent, Tom Sutcliffe noted that "As a grown-up you might quibble with the fact that they don't always distinguish between things that genuinely are true and the things that people would like to be (sadly, there's no hard evidence that Aeschylus was brained by a tortoise dropped by an overflying eagle)", but added that "children and adults alike should enjoy the gleefully anachronistic way in which the information is presented." Dent in The Guardian, while conceding what she called the show's "frankly slapdash, dumbed-down approach to history", also argued that "in Horrible Histories there are always serious messages lurking amid the silliness." In its debut week of 15 June 2009, the show topped the UK children's TV viewing figures with 191,000 viewers. The first series reached a viewing peak of 50% of UK children aged 6–12, while the second was watched by 34% of UK children aged 6–12, or 1.6 million total. Throughout its run, the show routinely ranked at or near the top of the CBBC ratings, reaching a peak of 548,000 viewers for Episode 10 of Series 5. Horrible Histories received numerous domestic and international awards and nominations, including several BAFTA Children's Awards, two British Comedy Awards and a Rose d'Or Award for Best Children's Programme. It is the first children's programme to win a British Comedy Award and four successive children's BAFTAs, for Best Comedy. In 2013 the show was also named in a Radio Times poll of all-time greatest British children's TV series, and was cited at No. 8 in a similar Top 50 list presented later the same year by Channel Five. All five series of the original show, plus the "Scary (Halloween) Special", "Ridiculous Romance" & the "Frightful First World War Special" and "Horrible Christmas" have been released on Region 2 DVD by 2entertain for the BBC, both individually and as boxed sets. Each series, as well as the "Scary Special" and "Sport Special", are also available for download from the UK iTunes store. As of February 2014, all episodes from Series 1–3 were available for download to American audiences on Amazon.com "Instant Video" service. In 2011, a spinoff game show, Horrible Histories: Gory Games, was launched on CBBC. Likewise coproduced by Lion TV and Citrus, the show is co-hosted by Dave Lamb with puppet Rattus Rattus and includes cameos from many of the parent show's cast. As of 2013, the show had aired three full series. For summer 2011, the show was repackaged for adult Sunday-night audiences as Horrible Histories with Stephen Fry, a six-part "best of" compilation for main channel BBC One. The show featured a selection of sketches and songs from the first two series as chosen by the producers of the parent show, with Fry replacing the puppet rat as presenter. On 18 September 2015 Bill, a 2015 BBC comedy film based loosely around the early life of William Shakespeare, was released. The film, though not officially related to the series, reunited and starred the original core performers of Horrible Histories in starring roles. In October 2017, it was announced that Altitude Film Entertainment and Citrus Films were producing a film adaptation. Dominic Brigstocke will direct, and it will be set in Roman Britain. The film, Horrible Histories: The Movie – Rotten Romans will be released July 26, 2019. The original cast of the TV series are not involved, although members of the revival cast are. ^ Series, in this context, is the British equivalent of the American television season. ^ With the exception of Episode 5 of Series 1, produced before the music became a priority as described below. ^ Citrus Television was formed by several of the Horrible Histories producers during the show's first series, and is credited alongside LionTV from the second series onward. ^ Scanlon, Margaret (2011). "History beyond the academy: humor and horror in children's history books". New Review of Children's Literature and Librarianship, 16:2, 69–91. 16 (2): 69–91. doi:10.1080/13614541.2010.540197. ^ a b c d e f g h i j k l m n Hickman, Leo (17 March 2011). "How Horrible Histories became a huge hit". The Guardian. Retrieved 19 June 2013. ^ a b c d e "About: Horrible Histories". British Comedy Guide. Retrieved 10 December 2013. ^ a b c d e f g h West, Naomi (25 May 2010). "How Horrible Histories grew up to be a hit comedy show". The Daily Telegraph. Retrieved 17 July 2010. ^ a b c d e f g h i j Preston, Richard (21 February 2013). "Horrible Histories: 20 years of entertaining children". The Daily Telegraph. Retrieved 10 December 2013. ^ a b c d Stephenson, David (29 May 2011). "Horrible Histories: a funny way to learn". The Sunday Express. Retrieved 10 December 2013. ^ a b Interview with Laurence Rickard and Mathew Baynton. BBC News. 2 June 2010. ^ a b c d Norris, Caroline with the starring cast (18 March 2012). "Horrible Histories Series Four BFI Q&A". British Film Institute. Retrieved 19 June 2013. ^ a b c d e McLean, Gareth (9 April 2012). "Why did the League of Gentlemen choose to reform on Horrible Histories?". Radio Times. Retrieved 31 July 2013. ^ a b "'Horrible Histories' in the press". British Comedy Guide. Retrieved 12 December 2013. ^ a b c d Mills, Kerrie (9 November 2011). "Horrible Histories: or, how children's TV grew up in a hurry". PopMatters. Retrieved 12 December 2013. ^ a b "Horrible Histories". British Comedy Guide. Retrieved 27 July 2011. ^ a b c d Stephenson, David; Norris, Caroline; with the starring cast (12 May 2013). "Horrible Histories Series Five BFI Q&A" (YouTube). British Film Institute. Retrieved 12 February 2014. ^ Ashby, Emily (2014-02-28). "Review: Horrible Histories". Common Sense Media. Retrieved 3 March 2014. ^ a b c d e f g Norris, Caroline; Farnaby, Simon; Howe-Douglas, Martha (19 September 2012). "Symposium: Horrible Histories: A Masterclass" (YouTube). MediaGuardian Edinburgh Television Festival 2012. Retrieved 17 October 2012. ^ a b c d Brown, Maggie (25 May 2011). "Horrible Histories: comedy for all ages". The Guardian. Retrieved 12 December 2013. ^ a b Kelly, Stephen (12 April 2012). "Horrible Histories is one of the smartest comedies on TV". The Guardian. Retrieved 3 October 2012. ^ Kelly, Stephen (6 August 2012). "CBBC meets Royston Vasey". The Independent. Retrieved 16 February 2014. ^ a b c Dent, Grace (28 May 2011). "Grace Dent's TV OD: Horrible Histories". The Guardian. Retrieved 13 December 2013. ^ a b Parker, Robin (11 June 2012). "Horrible Histories Jubilee sketches will never be aired". Broadcast. Retrieved 17 February 2014. (Subscription required (help)). ^ a b Brogan, Benedict (1 August 2011). "BBC Prom 2011: Prom 20: Horrible Histories, Albert Hall, review". The Daily Telegraph. Retrieved 31 July 2013. ^ "Horrible Histories: Episode Guide". British Comedy Guide. Retrieved 3 February 2014. ^ a b c d e Seale, Jack (6 June 2013). "Horrible Histories: Five brilliant songs from Series 5". Radio Times. Retrieved 17 June 2013. ^ Interview with Mathew Baynton, Jim Howick and Martha Howe-Douglas. This Morning. 12 April 2012. ^ a b c d e f g h Hodgman, Charlotte (30 May 2013). "Podcast: Behind the scenes at Horrible Histories". BBC History (mp3 podcast file). Retrieved 12 December 2013. ^ "National curriculum in England: history programmes of study". Official United Kingdom government website. 11 September 2013. Retrieved 28 February 2014. ^ Tate, Gabriel (6 November 2013). "Yonderland: Horribly ever after". Time Out. Retrieved 10 December 2013. ^ a b "Kids TV, seriously". Television Business International. 22 November 2013. Retrieved 14 December 2013. ^ Gilbert, Gerard (26 January 2011). "Horrible Histories: The best laughs are on children's TV". The Independent. Retrieved 31 July 2013. ^ Loveday, Samantha (11 October 2007). "Horrible Histories heading to TV". Licensing.biz. Retrieved 8 February 2014. ^ a b c Stephenson, David (22 April 2012). "Horrible history's a hoot". The Daily Express. Retrieved 11 December 2013. ^ "Art of Horrible songwriting". Sheffield Telegraph. 28 June 2013. Retrieved 31 July 2013. ^ "Noisegate Media Portfolio: Horrible Histories". Noisegate Media. Retrieved 27 February 2014. ^ "Baby Cow Animation: Design & Production". Baby Cow Animation. Archived from the original on 26 February 2014. Retrieved 27 February 2014. ^ Horrible Histories behind the scenes: find out how we make the drawings come alive. Horrible Histories: Behind the Scenes. CBBC Online. ^ Horrible Histories behind the scenes: special effects with just a big green sheet. Horrible Histories: Behind the Scenes. CBBC Online. ^ "2014 Specials – Horrible Histories". British Comedy Guide. 23 January 2014. Retrieved 23 January 2014. ^ a b "Horrible Histories to continue with specials". British Comedy Guide. 5 July 2013. Retrieved 31 July 2013. ^ "CBBC Proms: Horrible Histories' Big Prom Party". BBC Proms online guide. Retrieved 27 February 2014. ^ a b "Horrible Histories With Stephen Fry: Sport Relief Special". British Comedy Guide. 23 March 2012. Retrieved 27 February 2014. ^ "Horrible Histories Sport Relief: The Bob Report". Radio Times. 20 August 2012. Retrieved 28 February 2014. ^ Stephenson, David (26 May 2013). "The end of history as we know it". The Sunday Express. Retrieved 26 December 2013. ^ "Top comedy stars join CBBC's Horrible Histories". BBC Media Centre. 5 January 2015. Retrieved 28 April 2015. ^ Fowler, Martina (24 May 2010). "Interview with Laurence Rickard". TV Choice. Retrieved 10 December 2013. ^ Dobbs, Sarah (8 November 2013). "Interview with Mathew Baynton and Jim Howick". Den of Geek. Retrieved 10 December 2013. ^ a b Dobbs, Sarah (5 November 2013). "Interview with Laurence Rickard and Ben Willbond". Den of Geek. Retrieved 10 December 2013. ^ Sherwin, Adam (13 May 2013). "Horrible Histories to hit the big screen with first feature film: Untold story of William 'Bill' Shakespeare to be told". The Independent. Retrieved 4 June 2013. ^ "Horrible Histories series two debuts". Press Packs: Horrible Histories. BBC Press Office. 13 May 2010. Retrieved 21 March 2014. ^ "Tanni Grey-Thompson lands role in Horrible Histories TV show". Wales Online. 3 July 2011. Retrieved 21 March 2014. ^ Jarvis, Alice-Azania (17 April 2009). "Last night's television: Horrible Histories". The Independent. Retrieved 9 February 2013. ^ Venning, Harry (27 April 2009). "Horrible Histories review". The Stage. Retrieved 12 December 2013. ^ Midgley, Carol (May 20, 2011). "Horrible Histories: the hysterical success story". The Times. Retrieved 13 December 2013. (Subscription required (help)). ^ Delingpole, James (9 June 2010). "History like it used to be". The Spectator. Retrieved 5 February 2014. ^ Heal, Clare (6 May 2011). "Horrible Histories: Sands reveal secrets". Daily Express. Retrieved 31 July 2013. ^ Virtue, Graeme (17 April 2012). "Television review: Horrible Histories". The Scotsman. Retrieved 16 December 2013. ^ Ross, Deborah (1 June 2013). "Kids gone. Horrible Histories on. Hooray!". Daily Mail. Retrieved 19 June 2013. ^ Dempster, Sarah (25 May 2013). "Horrible Histories is back and it's as brilliant as ever". The Guardian. Retrieved 19 June 2013. ^ Dent, Grace (31 May 2013). "Grace Dent on TV". The Independent. Retrieved 12 December 2013. ^ Venning, Harry (21 May 2013). "TV review: Horrible Histories". The Stage. Retrieved 13 December 2013. ^ Lyons, Margaret (August 26, 2016). "What You Should Watch if You Have Kids or Miss 'Downton Abbey'". The New York Times. ^ Paton, Graeme (30 December 2013). "Michael Gove criticises 'disconnected' history lessons". The Telegraph. Retrieved 3 January 2014. ^ Hoggart, Simon (2 June 2010). "Shakespeare in school". The Spectator. Retrieved 31 July 2013. ^ "BBC rapped over Horrible Histories Florence Nightingale sketch". BBC News. 30 September 2014. Retrieved 22 October 2014. ^ Lowman, Anna (20 June 2011). "TV Reviews: Horrible Histories with Stephen Fry". Dork Adore. Archived from the original on 16 December 2013. Retrieved 13 December 2013. ^ Lay, Paul (20 June 2011). "Is 'Horrible Histories' suitable for adults?". History Today. Retrieved 15 February 2014. ^ Wolf, Ian (5 December 2011). "Horrible Histories to be remade for adult audience". British Comedy Guide. Retrieved 13 December 2013. ^ Sutcliffe, Tom (2 June 2010). "Last Night's TV". The Independent. Retrieved 17 July 2010. ^ "Horrible TV series back at the top". Scholastic Books UK. 15 June 2009. Archived from the original on 27 July 2011. Retrieved 27 July 2011. ^ "Viewing data: Top 10". BARB data. Archived from the original on 18 July 2014. Retrieved 9 February 2014. ^ a b "Miranda leads winners at British Comedy Awards 2010". British Comedy Guide. 23 January 2011. Retrieved 18 June 2013. ^ "Horrible Histories wins fourth consecutive children's BAFTA". BBC News Online. 25 November 2013. Retrieved 17 December 2013. ^ Noah, Sherna (30 July 2013). "Peppa Pig, Bob the Builder join ranks of top children's TV show". The Independent. Retrieved 11 December 2013. ^ Langsworthy, Billy (12 November 2013). "Channel 5 reveals Greatest Kids TV Shows results". Licensing.biz. Retrieved 14 February 2014. ^ a b "Children's BAFTA award winners and nominees in 2009". BAFTA website. Retrieved 18 June 2013. ^ "RTS Announces Winners for the Programme Awards 2009" (PDF). Royal Television Society. 16 March 2010. Retrieved July 31, 2013. ^ "AIB announces winners of the 2010 AIBs". Association for International Broadcasting. 10 November 2010. Retrieved 8 October 2012. ^ a b c "Three children's BAFTAs for Horrible Histories". BBC News Online. 29 November 2010. Retrieved 9 February 2014. ^ "2010 Children's BAFTA Kids' Vote – Television". BAFTA website. Retrieved 18 June 2013. ^ "PRIX JEUNESSE INTERNATIONAL 2010 Prize Winners" (PDF). Prix Jeunesse Foundation. 2 June 2010. Retrieved 8 February 2014. ^ "RTS Programme Awards 2010". Royal Television Society. Retrieved 2013-06-18. ^ a b c d "Children's BAFTA award winners and nominees in 2011". BAFTA website. Retrieved 18 June 2013. ^ "British Comedy Awards 2011 winners announced". British Comedy Guide. 16 December 2011. Retrieved 2 November 2012. ^ Wightman, Catriona (3 February 2011). "In Full: Broadcast Awards 2011 Winners – TV News". Digital Spy. Retrieved 18 June 2013. ^ a b c "And the Kidscreen Awards go to ..." Kidscreen. 18 February 2011. Retrieved 2 November 2012. ^ "Nominees for the 2011 Royal Television Society Programme Awards announced". The Daily Telegraph. 20 March 2012. Retrieved 9 February 2014. ^ a b c "Children's BAFTA award winners and nominees in 2012". BAFTA website. Retrieved 18 June 2013. ^ "British Comedy Awards 2012 – Full Results". British Comedy Guide. 12 December 2012. Retrieved 18 June 2013. ^ "Broadcast Awards – Shortlist 2012". Broadcast. Archived from the original on 4 March 2013. Retrieved 18 June 2013. ^ a b Castleman, Lana (9 February 2012). "And the 2012 Kidscreen Awards go to ..." Kidscreen. Retrieved 2 November 2012. ^ "Rose d'Or 2012 comedy winners announced". British Comedy Guide. 10 May 2012. Retrieved 18 June 2013. ^ a b c "RTS ANNOUNCES WINNERS FOR CRAFT & DESIGN AWARDS 2011/2012". Royal Television Society. Archived from the original on 5 April 2013. Retrieved 18 June 2013. ^ "Writers' Guild Awards 2012 shortlists". UK Writer's Guild. 14 September 2012. Archived from the original on 13 May 2013. Retrieved 18 June 2013. ^ "Children's BAFTA award winners and nominees in 2013". BAFTA website. Retrieved 17 December 2013. ^ Denham, Jess (3 December 2013). "British Comedy Awards 2013: List of nominees in full". The Independent. Retrieved 9 February 2014. ^ a b "RTS Craft & Design Awards 2012/2013". Royal Television Society. 19 November 2013. Archived from the original on 17 December 2013. Retrieved 17 December 2013. ^ a b c "And the 2014 award winners are ..." Kidscreen. 11 February 2014. Retrieved 25 February 2014. ^ ""Horrible Histories" in DVD & Blu-ray". Amazon UK. Retrieved 26 February 2014. ^ "Horrible Histories on iTunes". iTunes UK Store. Retrieved 26 February 2014. ^ "Horrible Histories Series 1–3". Amazon Video. Retrieved 26 February 2014. ^ "Episode Guide: HH Gory Games". Radio Times. Archived from the original on 22 February 2014. Retrieved 7 February 2014. ^ "Horrible Histories With Stephen Fry". British Comedy Guide. Retrieved 7 February 2014. ^ Solutions, Powder Blue Internet Business. "Horrible Histories heads to the big screen : News 2017 : Chortle : The UK Comedy Guide". www.chortle.co.uk.